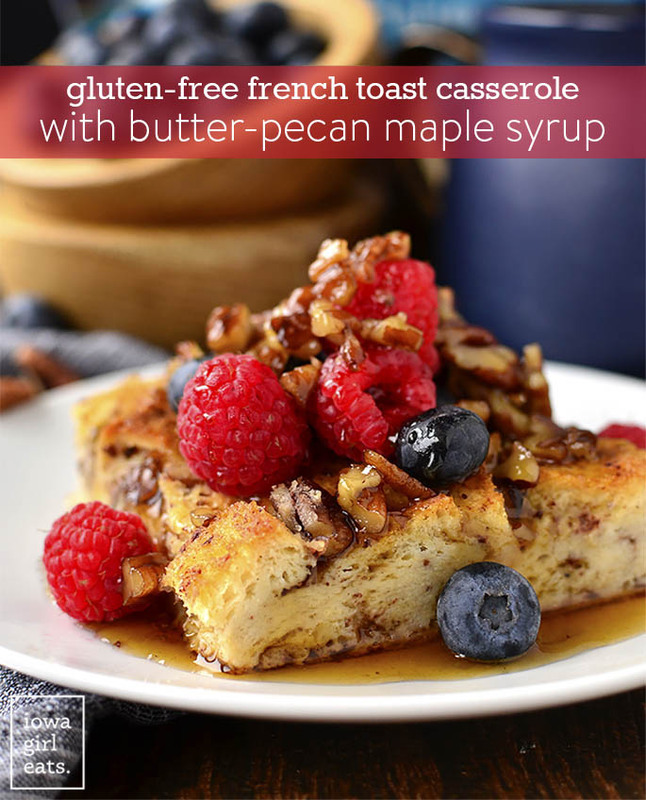 Gluten-Free French Toast Casserole with Butter-Pecan Maple Syrup is make ahead and perfect for feeding a crowd. 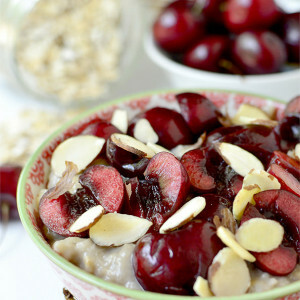 This gluten-free breakfast or brunch recipe will WOW! If you’re a fan of French Toast, cinnamon rolls and pancakes in the morning – especially on a holiday morning – boy do I have a treat for you. 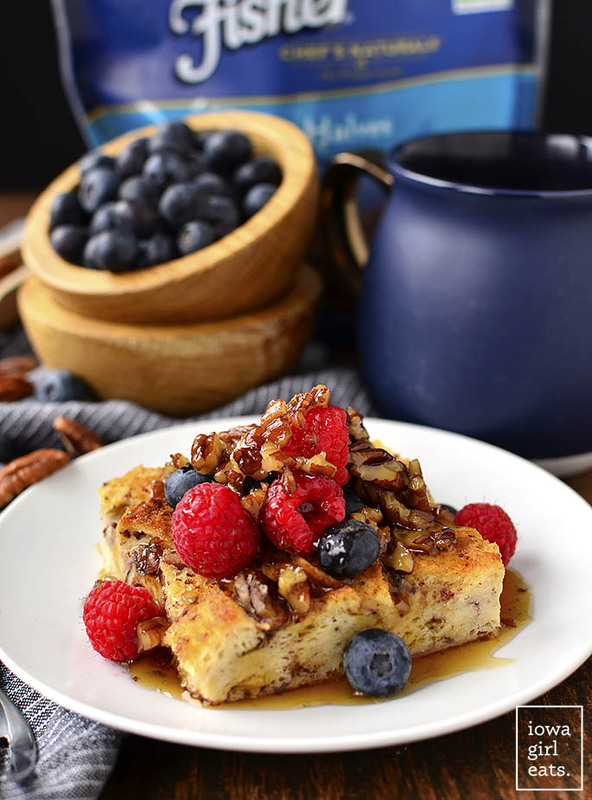 Gluten-Free French Toast Casserole with Butter-Pecan Maple Syrup, sponsored by Fisher Nuts, is make-ahead, feeds a crowd, just sweet enough, and needs to be added to your must-make list for later this week! Honestly, when it comes to breakfast I usually go the bacon and eggs route. That’s why I’ve shared not one, not two, but four savory breakfast casserole recipes here on IGE over the years. (Crock Pot Breakfast Casserole, Breakfast Taco Casserole (<< OMG), Roasted Poblano and Sausage Casserole, and regular ol’ Breakfast Casserole.) That said, this year for Thanksgiving I knew I had to go sweet or go home. And since I’m already home, I went sweet. Whee! My family and I love to dig into a big breakfast casserole on Thanksgiving and Christmas morning with tons of coffee and mimosas. Everyone grabs a piece when they wake up or arrive at the hosts home, and gets the day started with a special breakfast. So, instead of sharing one.more.Thanksgiving.dinner.recipe. 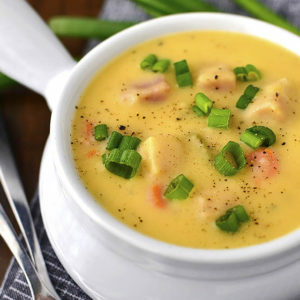 with you today, I thought I’d give you a yummy dish to wake up with instead. 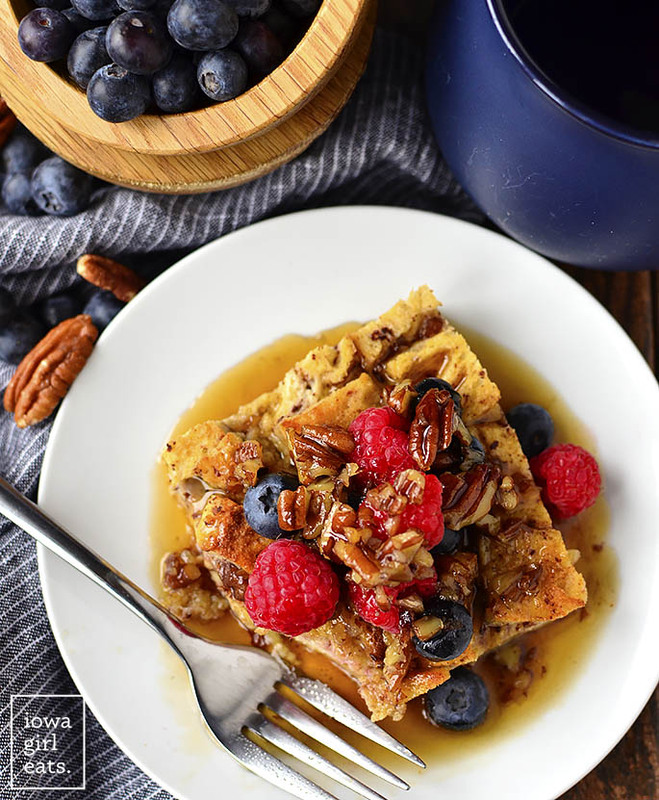 Gluten-Free French Toast Casserole is the perfect way to kick off Thanksgiving, mostly thanks to the MOST DELICIOUS ELIXIR of maple syrup infused with chopped pecans roasted in butter drizzled on top! The delicious duo of butter-pecan has been in my top 5 most favorite flavor combos since I was a kid. Almost every single summer afternoon my best friend and I would bike to Iggy’s ice cream shop for flavor-swirled cones, and while she would order something age-appropriate like bubblegum or blue-raspberry, I chose butter-pecan like the 80 year old soul that I am. That said, imagine how tickled my tastebuds were when I re-created the butter-pecan flavor I loved as a child at home with ACTUAL BUTTER AND PECANS, and then did the dang thing and added pure maple syrup to it?! I cannot even describe how delicious this syrup is – you’re truly going to have to try it yourself. As I mentioned, my Gluten-Free French Toast Casserole with Butter-Pecan Maple Syrup is sponsored by Fisher Nuts, who I’ve been partnering with for years and years. Their nuts contain zero preservatives, come in resealable bags which means they stay fresher longer, and above all else their nuts are extremely high quality. 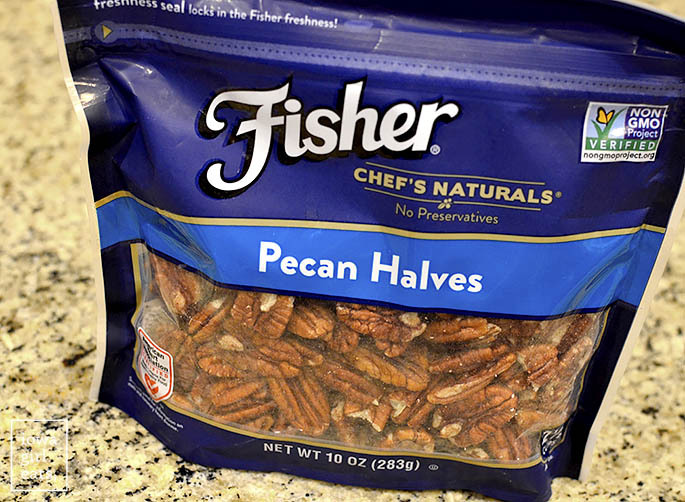 I chopped up Fisher Naturals pecan halves for this recipe but if I were making a Pecan Pie for instance, where using a fully intact and unblemished pecan half is important – Fisher’s your brand. 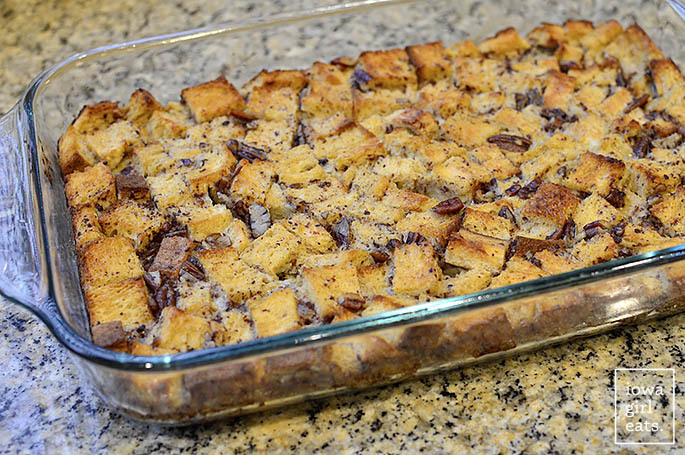 As I mentioned, this French Toast Casserole is make-ahead so I usually assemble at night then bake in the morning. That said, grab your nightgown and slippers and let’s prep! 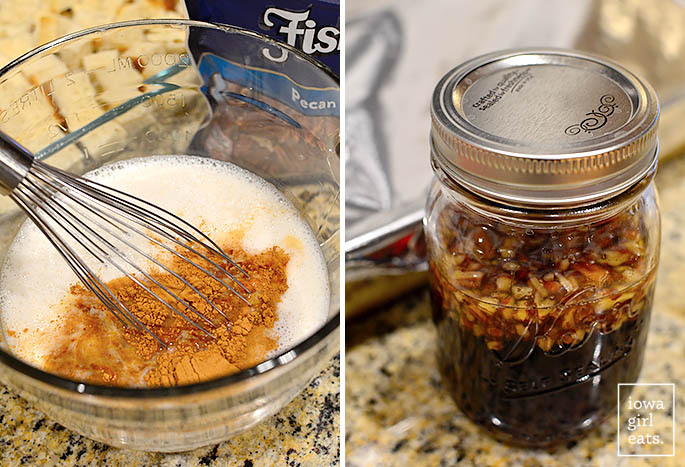 Start by making the Butter-Pecan Maple Syrup. Melt 4 Tablespoons butter or vegan butter in a small saucepan over medium heat then add 3/4 cup Fisher Naturals Pecan Halves that have been roughly chopped. 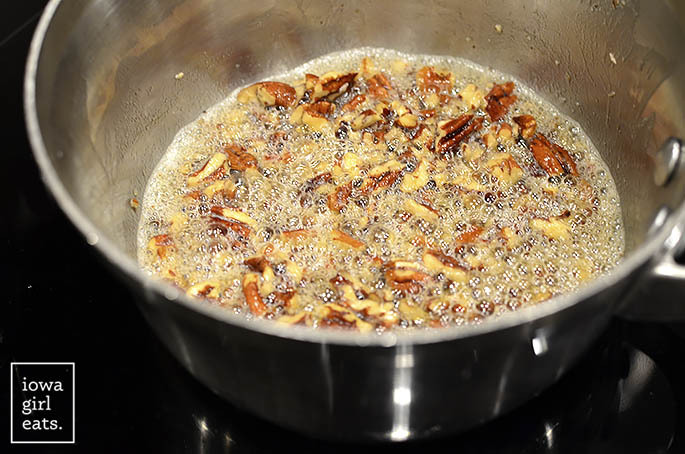 Cook until the pecans are light golden brown, 8-10 minutes, stirring occasionally. Next add 1-1/2 cups pure maple syrup (not pancake syrup), then turn off the heat and let the syrup infuse while you assemble the rest of the casserole. Tasting at this point is both encouraged and discouraged because trust me – if you start, it’ll be nearly impossible to stop. That said, spoon drink at your own risk! Onto the casserole. Trim away any tough crusts from an 18oz loaf gluten-free bread (I love Canyon Bakehouse Mountain White bread) then cut the slices into bite-sized cubes and arrange in the bottom of a non-stick sprayed 9×13″ baking dish. In a large bowl whisk together 6 large eggs, 2 cups milk (any kind – I used unsweetened almond milk) 1/2 cup prepared Butter-Pecan Maple Syrup, 1 Tablespoon vanilla, and 1-1/2 teaspoons cinnamon. Pour over the bread cubes then press down with a spatula to make sure they’re all soaked. Cover the dish with foil then package the remaining Butter-Pecan Maple Syrup and refrigerate for 2-12 hours. When you’re ready to eat, remove the casserole dish from the refrigerator to warm up slightly while the oven preheats to 350 degrees. Bake uncovered for 40-45 minutes or until the eggs are set in the center and the top is golden brown and slightly crispy. Check the casserole around the 30 minute mark – if the top is browning too quickly, place the foil back on top and continue baking. Let the casserole cool for 10 minutes before slicing and serving with the remaining Butter-Pecan Maple Syrup – if you stored it in a mason jar like I did you can simply remove the lid then zap it in the microwave for a minute or so. Since I’m suggesting you serve the Gluten-Free French Toast Casserole for the holidays, it’s a nice touch to serve fresh berries on top. Either way, you and your family are going to devour this sweet and decadent-tasting breakfast casserole. Enjoy, enjoy – and have a fabulous Thanksgiving!! For the Butter-Pecan Maple Syrup: Melt butter in a small saucepan over medium heat. Add chopped pecans then cook, stirring occasionally, until pecans are light golden brown, 8-10 minutes. Add maple syrup then stir to combine and turn off the heat. Let syrup sit and infuse while preparing the rest of the casserole. For the French Toast Casserole: Spray a 9x13” baking dish with nonstick spray then set aside. 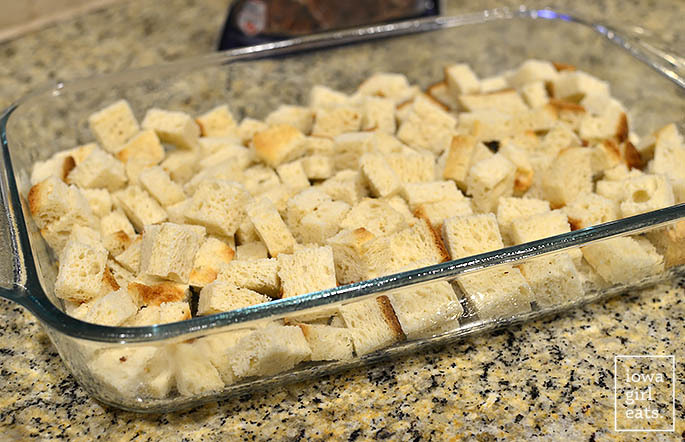 Trim away any tough crusts from the bread slices then slice into bite-sized cubes and arrange in the bottom of prepared baking dish. Preheat oven to 350 degrees. Pull the baking dish out of the refrigerator to warm up a bit then gently press on the bread cubes again with a spatula to evenly distribute the egg mixture - do not pack bread cubes down though. Bake for 40-45 minutes or until the eggs are set in the center and the top is golden brown and slightly crispy. Check the casserole around the 30 minute mark - if the top is browning too quickly, place a piece of foil on top of the baking dish then continue baking. Let casserole cool for 10 minutes before slicing. 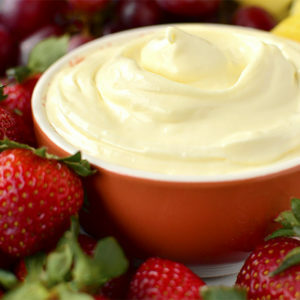 Warm remaining Butter-Pecan Maple Syrup then serve with fresh berries, if using. This is a sponsored conversation written by me on behalf of Fisher. The opinions and text are all mine. That looks and sounds wonderful! If one isn’t cooking gluten-free, would any type of mountain bread work? French bread? Yep, I’d go with a loaf of french cut into 1″ thick slices! This looks so amazing, Kristin! 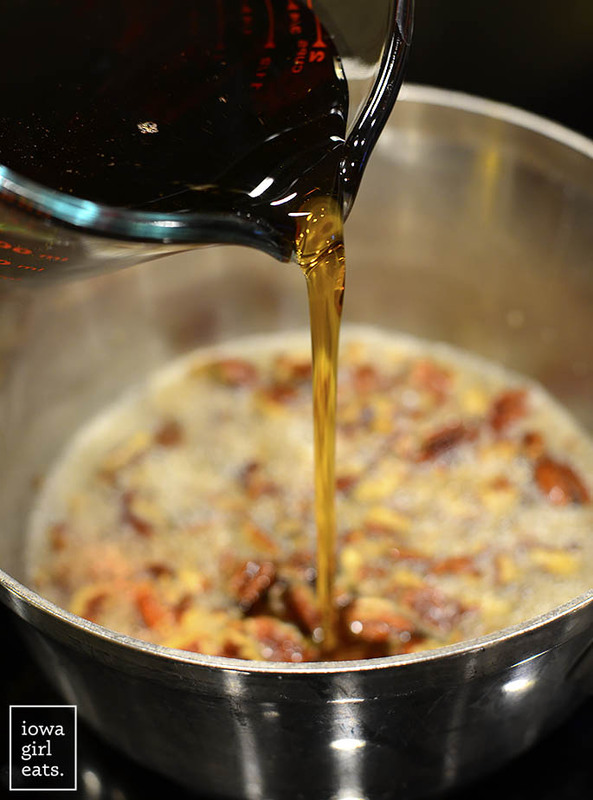 I’ve never thought to infuse maple syrup with pecans but I will definitely be doing it when I make this Friday morning. By the way- I make your skillet enchilada recipe at least once a month and it has become a favorite in my house. Thank you so much! Have a very happy thanksgiving! It is sooo good – I hope you love it, Brianna! And I’m so glad you love the skillet enchiladas – I have them on tap for this weekend using turkey! Sorry a bit of a dumb question, but is it best to refrigerate for a couple of hours first or can you bake in oven straight away? Not a dumb question! Yep, you’re right – you’ll need to refrigerate the casserole for 2-12 hours. The recipe will guide you through it! 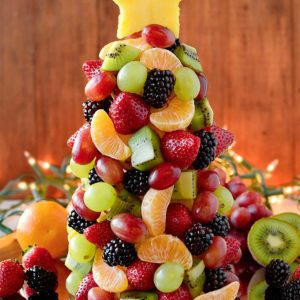 I would love to make this diabetes-friendly for family! Any ideas? Hi Melissa! You could use sugar free syrup in place of the pure maple syrup. Oh man… just in time for Thanksgiving day guests! 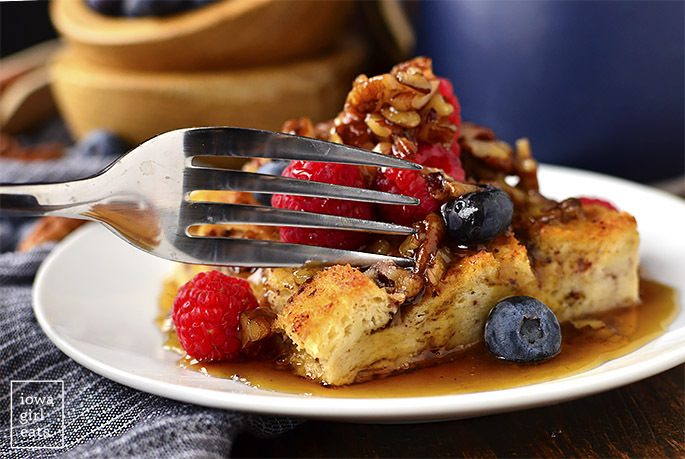 This French Toast Casserole looks like an incredible breakfast! I’ll definitely be trying it out soon! Happy Thanksgiving to you and your family! 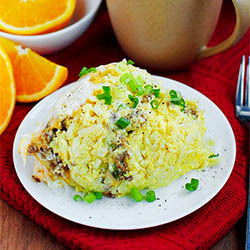 We enjoyed this Thanksgiving morning – thank you for the recipe!! Prepared it the afternoon before and didn’t even bother cutting the crust off. It was delicious!! Oh I’m SO glad to hear it, Ginny! 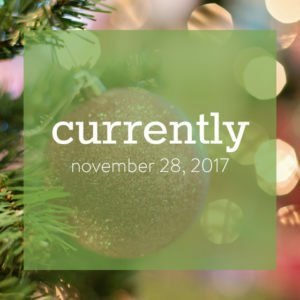 Hope you all had a wonderful holiday and thank you so much for your feedback! Any recipes for gfree monkey bread? I typically make this for Christmas morning but this year, my daughter has been diagnosed with celiac so I’d like to make it so everyone can enjoy. Thank you! Can I put it in the fridge for longer than 12 hours? 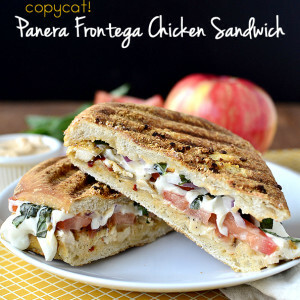 Just made and am using for a brunch tomorrow! It could probably go up to 15 hours! Whipping this up for a food day tomorrow at work. I used unsalted butter when making the pecan sauce and realized that was a mistake as it tasted bland when I first tried it. So then I just added a small pinch of sea salt and the flavor really came out. You got it – I would use a SF/DF butter like Earth Balance! I made this for 4 of our teenage grandchildren.. they loved it! We all agreed that next batch would include much more pecans cooked into the bake.